OpenCPU provides a RESTful interface to the popular open-source statistical package R, enabling the user to perform calculations and create publication-quality or web-embeddable visualizations via standard web requests. They have a very informative FAQ. That looks quite useful, but it's not REST, it's RPC. About as pure an example of RPC as you'll find, in fact. It's not a bad thing that it's not REST (RPC maps much more clearly to what it's doing), it's just a fact. More examples would be great. I wonder how easy it would be to use it to make an online R REPL. REST would be awesome for R.
Huh. Looks like you can work with canned data or work with your own data by uploading files. OK, so, probably this isn't any kind of scheme to get ridiculous people to upload sensitive data files to their servers. But this plus a quick scan of each uploaded file for credit card numbers and SSNs would be a really low-effort little scam. Revolution Analytics blog post about OpenCPU. Are they planning to release a package to set up your own OpenCPU server/cluster? This seems like a nice alternative to Rpy or Rweb, but lots of problem sets (e.g. genomics) will require custom packages and aren't amenable to large dataset transfers. 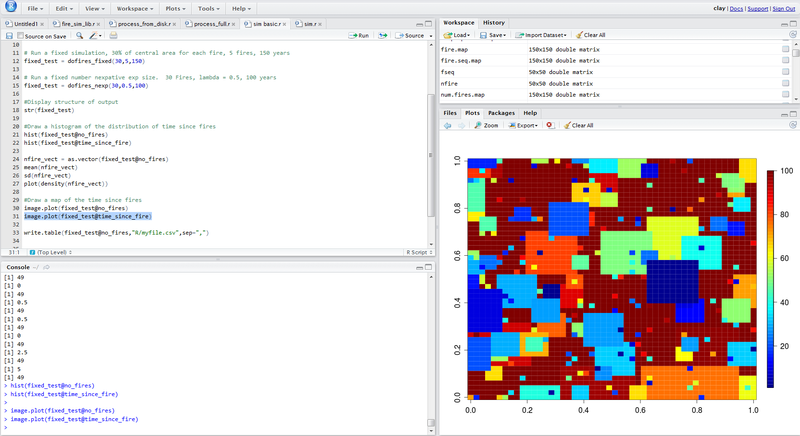 Another R project I've become completely smitten with over the last few weeks is R Studio - a very sweet web-based interface for R that I've installed and am encouraging my students to use. Screenshot - all in the browser, and it's got a nicer interface than RGui or RKward. Tangential: Everything You Know About REST Is Wrong. I just discovered Revolution Analytics this week after dusting off the old R install for a work project. Wonderful site, and it's amazing what some of the R and data geeks are doing out there right now. Just browsing through the October Roundup wasted way too much time. That's kind of interesting; I just don't see what the use of it is. People who want to play with R code I write can run it themselves without needing to learn yet another interface. The selling point of reproducability is misplaced, since they are highly likely to fail as an enterprise. I guess doing html embedding and thier interface will be easier for some people than sweave, or static code plus html. I thought it was interesting initially as a better way of doing Google Charts, one that makes nicer and higher quality graphs, while also rendering lower-quality versions that can sit comfortably in a web page/lab manual. Interesting that the images on the front page are almost all targeted at bio/pharma/neurosci. Would be nice if the front page loaded.